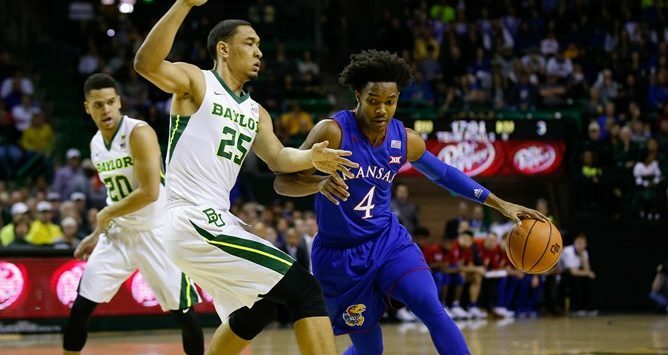 Devonte’ Graham earned Kansas’ ninth overall and second-consecutive Player of the Year honor while Bill Self (Kansas) and Chris Beard (Texas Tech) tied for Coach of the Year, headlining the 2017-18 Phillips 66 All-Big 12 Men’s Basketball awards. Graham led the Jayhawks to their 14th consecutive and 18th overall Big 12 regular season title. He was the unanimous choice for Player of the Year and the All-Big 12 First Team after earning second team accolades last year. Co-Coaches of the Year were chosen for just the second time in Conference history (2011-12). Self was honored for the sixth season and second consecutive. Beard picked up his first Big 12 honor in his second season at Texas Tech while guiding the Red Raiders to a second-place tie in the Conference. Jevon Carter (West Virginia) was named Big 12 Defensive Player of the Year for the second-straight season and is just the third player from an autonomy league to be named to an All-Defensive Team all four years of his career. He was a unanimous choice for All-Big 12 First Team and the Defensive Team. Terry Maston (Baylor) garnered the Sixth Man Award while Malik Newman (Kansas) picked up Newcomer of the Year and Trae Young (Oklahoma) was awarded Freshman of the Year. Young leads the nation in points (27.5) and assists (8.9). He was a unanimous pick on the All-Big 12 First Team and All-Big 12 Newcomer Team. Dean Wade (Kansas State) and Keenan Evans (Texas Tech) were also chosen to the All-Big 12 First Team along with Graham, Carter and Young.